Today I’m thrilled to have Dana Tran on the show. Dana is someone who I randomly met at Social Media Marketing World and I must say that I’ve been super lucky when it comes to bumping into random people at conferences. 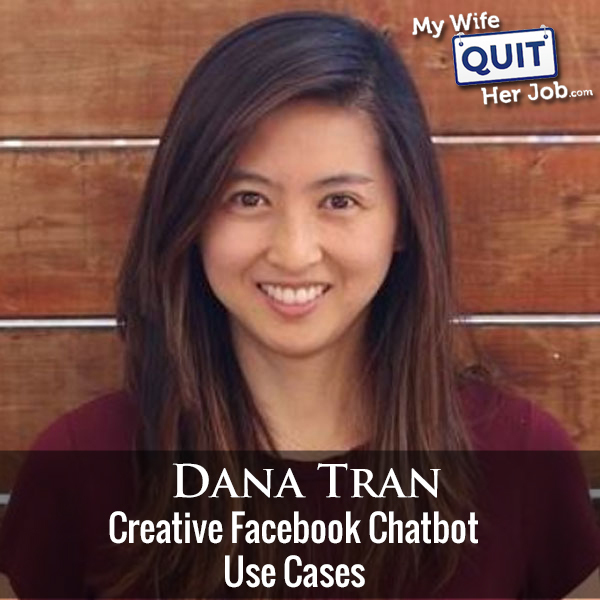 Dana runs Thinktuitive where she focuses on writing content for Facebook Messenger bots. In fact, she has a premium course called Bot Essentials that helps non techie entrepreneurs build their own chatbots. In today’s episode, Dana’s going to teach us how it’s done. Which lead gen method should have higher priority, email or bots? Intro: You’re listening to the My Wife Quit Her Job Podcast, the place where I bring on successful bootstrapped business owners and delve deeply into what strategies are working and what strategies are not in business. Now today I’ve got my friend Dana Tran on the show. And Dana has actually slowly become my go to gal when it comes to Facebook Messenger bots. And what I like about her is that she knows her stuff and she has a technical background. And today what we’re going to do is we’re going to discuss some practical use cases for bots. But before we begin, I want to give a quick shout out to Klaviyo who is a sponsor of the show. Now, I’m always super excited to talk about Klaviyo because they are the email marketing platform that I personally use for my ecommerce store, and I depend on them for over 30% of my revenues. Now Klaviyo is the only email platform out there that is specifically built for ecommerce stores, and here is why it is so powerful. Klaviyo can track every single customer who has shopped in your store and exactly what they bought. So let’s say I want to send out an email to everyone who purchased a red handkerchief in the last week, easy. Let’s say I want to set up a special auto-responder sequence to my customers depending on how much they purchased, piece of cake, and there is full revenue tracking on every single email. Klaviyo is easily the most powerful email platform that I’ve ever used and you could try them for free at mywifequitherjob.com/K-L-A-V-I-Y-O. Once again, that’s mywifequitherjob.com/K-L-A-V-I-Y-O. Steve: Welcome to the My Wife Quit her Job Podcast. Today, I’m thrilled to have Dana Tran on the show. Now, Dana is someone who I actually randomly met at Social Media Marketing World, and I have to say that I’ve been super lucky when it comes to bumping into random people at conferences. Dana runs thinktuitive.com where she focuses on writing content about Facebook Messenger bots. And in fact she has a premium course called Bot Essentials — I’m not sure if the name has changed, that helps non techie entrepreneurs build their own bots. Now, as you all know, I’ve been really into Messenger bots for quite some time now. And what I like about Dana is that she’s the perfect blend of tech and communicator. Today, she’s going to teach us about Facebook Messenger marketing. Welcome to show Dana, how you doing today? Dana: I’m doing great, thanks so much for having me on. I’ve been listening to you for I don’t know how long now, so it just feels such an honor to be on the show actually. Steve: It’s actually – the pleasure is actually all mine. So Dana, we did meet randomly at S&MW, give us a quick background story. Tell us how you got into Facebook Messenger bots in the first place? Dana: Well, I am — I consider myself a digital coach. I teach and help small businesses how to build interactive bot experience to help them increase the engagement and of course, all without coding. I focus mainly on non techie entrepreneurs. And my background is a mixture of tech with HR, and I specialize in E-learning and process improvement. So, back in the days when I used to be a consultant, I mainly worked on HR IT enterprise system, kind of not the most exciting things in the world. But I helped businesses become more productive and efficient with the help of technology. And I found out about Messenger bots during their F8 conference. And this was back in April 2016, I think. And I was just watching it online and learn about Messenger bot. And I just thought like wow, there’s just so much possibilities here. So, now I’m applying the same skill set that I used to have when I used to be a consultant working with larger companies. But I’m applying that to help smaller businesses become more productive, efficient, and show them how they can leverage Messenger bot to engage with visitors and customers, and providing them an interactive, fun experience. Steve: Cool. I must say, I’ve never met anyone who combines tech and HR. I didn’t think that really exists. Anyways, so one of the themes of Traffic & Conversions and Social Media Marketing World this past year was Facebook Messenger, and chatbots, chatbots, chatbots. So, what I was hoping to do today was maybe to go into depth on some of the best use cases that you’ve seen for businesses and Messenger bots. And let’s assume we have someone who’s running an ecommerce store, how would you implement a bot? And what are some creative cases that you’ve done or seen in the past? Dana: Well, with Messenger bot, I mean, I want to back up a bit just in case there’s somebody listening, and they don’t know what a bot is. Dana: So, a Messenger bot is a program inside Messenger that can automatically interact with people, answer common questions, and provide them with relevant information in an interactive way. So, that’s what a Messenger bot is. It’s not a replacement for your website, your email marketing, or any other tool. You really need to think of it as an additional tool that you’re adding to your current tool kit. So, what I like to do with Messenger bot is to provide value, educate with users, engage with them to move them along the customer journey from being a visitor to a subscriber, to a lead, and eventually a customer, which is what all businesses, the goal is to get people to eventually become a customer. And what you want to do is prompt them to take small actions, and also use it as customer support, which is really, really critical. And I think with internet, we’ve been in — over the past several years, it’s always been about pushing information out to user, blasting out information. And I think we kind of lost that human touch to it, because everything can be automated. And Messenger bots are great at automation, don’t get me wrong. But I also like to use it to have live one on one human to human conversation, because if a user needs something, and they have a question, you can actually reply back to user. So, suppose a user is out there researching your product, and they stumble upon your Facebook page, they can send you a message to your Facebook page, and you can reply back to them. Now, you can also embed a chat customer plug-in on your site and it’s that little bubble that appears in the bottom right hand corner. And I think you have it installed on your site. Steve: Yeah, I have it on the site yeah. It’s actually a great way to close the sale actually. Dana: Yeah, because sometimes people have certain questions that only a human can answer, right, a bot can’t answer everything. It’s not that smart yet. But that chat bubble, it kind of replaces — did you have like a natural live, like a live chat tool there before? Steve: I did not actually. I put that in just to get Messenger subscribers, and now we have someone in the Philippines manning that thing full time. Dana: Oh, wow. Okay. Yeah. So with some sites, I’ve seen them take down their live chat software, and just replace it with Messenger because it’s free. You don’t have to pay anything. And you can have a combination of like automated response through the Messenger bot, as well as live or hire somebody in the Philippines to man the live chat. And the one thing I like about it is when you compare it to the live, the traditional live chat software is that you can start a conversation from Facebook page or the website and say, you send them a message and the person to reply back and say, your guy in the Philippines is only manning that thing for 12 hours a day, let’s say because they need some sleep too, right? Dana: And you’re out at the grocery store. And he happens to reply back. Because you’re replying back on Messenger, you can actually reply back instantly. With live chat, when you reply back, it sometimes sends you an email notification, and then you have to go back to the website, and then you reply back. It’s not like in one central location. So, with Messenger being a communication tool, first and foremost, you can use it to have this great conversation and to help close the sale. That’s one thing I really like about it. Steve: Yeah, absolutely. I mean, what’s nice is all the messages are stored. Everyone uses Messenger today, for the most part. And so, all the conversations are already stored there. Unlike live chat, where they might actually have to go back to your site or use that specific chat window to communicate with you, Messenger is always present. Dana: Yeah, and they don’t have that time out, like have you ever chat with somebody on a site, and then you open a whole bunch of tabs. And later when you go back to that tab, it’s like, sorry, the conversation is now closed. And you’re like, oh, I have to wait again to have another conversation with the user. Dana: It’s really helpful that way. Steve: I mean, there are other features right now that the Facebook chat bot doesn’t have, sorry, the Facebook Messenger live chat doesn’t have a lot of these metrics that some of the other live chat programs have. But I mean, the benefits outweigh the negatives right now, it might be at least. Dana: Yeah, I think in your opinion. I mean, some still stick to live chat. I’m not saying live chat softwares are really bad, but it just depends on case by case basis. And I think the best way is to kind of test it out and see what works best for you. But another use case, the other the other thing I guess I want to warn people about is the limitations of Messenger. Even though you say it’s great, when it comes to your Messenger subscriber list. So unlike email where you can migrate your email list from one platform to another, you cannot do that easily when it comes to bot building platforms. So, you need to kind of test out the platform and choose wisely. Steve: So let me ask you this, since you’re on that topic, what do you recommend for ecommerce, which platform? Dana: Oh, boy. I mean, my two favorite platforms right now is ManyChat and Chatfuel in no particular order. I use them both actually. I have to Messenger bots; one is on ManyChat and the other one is with Chatfuel. And both have a payment feature where you can actually get users to buy a product directly in Messenger. Both can actually hook into third party databases if you want it to so that you can send data and even like so if you want to collect an email address inside your Messenger bot and send that to your email marketing software, you can actually do that. But yeah, I would say just test it, it just depends. Steve: Let me ask you this, what is the primary difference between the two in your opinion? Dana: Right now, the biggest difference is the user interface, the user interface. So with ManyChat, it has a mind map field to where you can kind of visually see how things are connected to each other. So, it can be really useful, except if you have a really big flow, then when you zoom out, you can’t really see anything other than squares and a whole bunch of lines, that doesn’t really mean anything to you anymore. Chatfuel has blocks. So it’s the sidebar where you can see all the different blocks with labels on it. And in each block, you could put in content like your texts, images, and things like that. But you don’t see how they’re linked to each other. But it’s okay, if you have a very complex bar, and you have a lot of logic built into it, because if you have a mind map with 100 different squares and 100 different lines and like, what does that really — you’re not getting any value from it anyways. So I would say that’s the biggest difference. Steve: So what you’re trying to say, I guess, is both tools are pretty much equivalent in terms of functionality. It’s just a matter of which you like better. Steve: Oh, okay you’re right. I remember that. I actually, I will just link that up instead of going through this on the podcast yeah. Dana: Because you asked me, what’s the biggest one difference, right? Then I would say what comes to mind most is the user interface. But if you’re talking about like nitty-gritty detail, then there are differences that both are adding. And I think I update that article every month now, to tell you the truth, because they’re adding new features to it all the time that it becomes outdated so quickly. So refer to that if you want to know about the specific detail. Steve: So, one thing I did want to ask you about is when I run email campaigns, I have an abandoned cart, a repeat purchase sequence, a post purchase sequence, let’s just take abandoned cart, for example, is there the equivalent in Messenger bot land for that? Dana: Yes, there is. So when it comes to abandoned cart, there’s two ways of kind of accomplishing that, right. The first way is easier. So, let me talk about that first. The first way is, if you have a gallery, let’s say, inside your Messenger bot, and it shows your product and there’s a bit of description about what your product is, how it’s great, what you can do is add a button to that just below that image, and have people check out right, and pay for that product directly inside Messenger. Steve: How does that work exactly? Do you have to upload your products or is it literally loading your site into Messenger? Like, how does it work? Steve: Does that mean you would have to link up your chat bot with your shopping cart, for example, then? Dana: If you’re doing it the web view way, then yes. If you’re doing it just through the gallery, the native Messenger gallery, then you would just add a buy button and you would just get an alert after people pay you through Stripe, let’s say. Steve: So once they pay through Stripe, you get a notification. But that notification needs to add an order to your shopping cart back end, right? Dana: Yeah, you could do it that way. I mean, it depends on if you have only a few products, then that’s probably easier. If you have hundreds or thousands, then you would probably need to hire a developer to kind of help you integrate everything. So it kind of depends on what you’re looking for, because I’ve seen for example, Lego has an amazing bot actually if you haven’t had a chance to check them out. But what they do is they create a questionnaire that asks you like who are you buying for? What’s your budget, what theme they like? And after you answer those questions, it gives you a recommendation of five products because Lego has probably millions. Dana: So they ask through questionnaire, they kind of help you pick out the right one for you, or whoever you’re buying for. And then under those five product recommendation, they have a little buy button that takes you to the website. And I think what they do as well before loading that buy button is they give you a discount code for free shipping that expires in X amount of days, or whatever it is. So it kind of pushes you to make that purchase a little quicker than you would otherwise. Steve: I see. So that’s actually ingenious. So, is that, as soon as you get on Lego’s site, and you initiate a chat, this wizard, I guess to help you find what you want to look for, is that the first thing that pops up? Dana: Yeah, that’s – well, I don’t know if that’s — that’s one of the options that you have. But if you do have, say 1,000 products or hundreds, I wouldn’t recommend creating a catalog inside Messenger, because it’s kind of like walking into — just imagine walking into like a big, I don’t know, Costco or something, you can kind of get lost. And you’re like, okay, what is it that I’m looking for, and you’re just wandering around the different aisles to kind of see what product there is, right? With Messenger bot, and if you have a lot of products, I would say pretend that that’s a virtual sales associate that you’re building. And what you could do instead is get that sales associate to ask each user, what are you looking for, and just help narrow down what the choices are, and then give product recommendation that suits them. Steve: Based on your best sellers, for example probably, right? Dana: Yeah, best sellers because like, at the end of the day, it’s kind of like Amazon, right? When you go onto Amazon, there’s just so much products. You either use a search, they also have personalized products for you that you can kind of see based on your past search history. Because with Messenger bots, suppose that you have a user that interacts with your bot before and you tag them, and you save certain information about them. So you already have a rough idea of what they’re interested in. You could send them a broadcast, I mean, now and then to make recommendation on what you think would be the best product for them. Like, you don’t want to send them a catalog with 100 products in there. Dana: They’re just going to go crazy. So use — it’s a very different mindset when it comes to building a Messenger bot, because you got to think about, okay, how can I use this creatively to actually help my users? It’s not like a WordPress site where users can just browse. It’s your window is very limited, because if you think about your texts that you get from your family, your friends, it’s very short text. It’s never a 500 word article and it’s never a whole bunch of images. Whenever somebody sends you a text, they kind of limit and think about, okay, what would Steve be interested in? And then they send it right. Steve: Yeah, I was just thinking about this right now, in the case of my own store, we had different gifts based on the occasion. So we could have a bot where we just ask them, what occasion are you shopping for a gift for? Steve: And then based on the responses, we could give, like, the best sellers for that given occasion for a given person. Dana: Yeah, you could do that, occasions, you can ask them maybe favorite colors, if they have been eliminated down? Do they like flowers? Or do they like initials, let’s say. And you can show them different patterns and things like that. And instead of — because with a gallery card, it’s — are you familiar with the gallery card? Steve: Why don’t you go ahead and explain it? Steve: Horizontal, left to right. Dana: Horizontal, yeah left to right, thank you. So they can only scroll horizontally but there’s only 10 options. And I think that’s — I mean, a lot of people complain and they’re like, oh, why doesn’t Facebook allow you to have 20 or 100? Like, do you really want to scroll through like 100 product recommendations? Steve: I mean I think 10 is actually a lot in my opinion. Dana: Ten is a lot. And I think Lego when they give the recommendation, I mean, take a look, and see what they do. But I think they only send like five. So it’s only like a quick scroll and you can see all the options. So, I really like what they did with theirs because it’s really fun. You’re not overwhelmed by so many different products. And the recommendation is relevant because you answered those questions, and they’re providing product recommendation based on your answers. Steve: Is all this done through buttons and not through text at all? Dana: Yes. So with Messenger bot, we’re not quite there in terms of it being super smart. If you want to allow users to type in actual questions, then what you could do is integrate it with third party kind of artificial intelligence tool like Dialogueflow, is one of them. But I find that people don’t really — typing requires more effort than like tapping. Steve: Oh no, absolutely, I was just curious. Dana: So it’s always better to give people an option to tap on buttons. And I always reserve actual text for when you’re getting users to fill out a form or submitting a question, or of course chatting with customer support, you want to give them the option to just say whatever they want to say in that case. Steve: Let me ask you this question; is it in a store’s best interest to try to check out a Messenger versus doing the checkout on their own site? Dana: I’d say it depends on the number of products you have because I mean, at the end of the day, it goes through Stripe. You can sell digital — sorry, you cannot sell digital products though through Messenger. So, if you have a store and you’re selling an eBook or something, then you cannot have it the payment process through Messenger. That’s not allowed by Facebook. It’s not a Chatfuel or ManyChat limitation; it’s a Facebook policy that you need to follow. But I think either way kind of works because going back to the abandoned cart, I think I mentioned the first way is to get people to if somebody taps on a product and say you give them — going back to the Lego let’s say, you give them recommendation and they looked at the product details for those five recommendation, and they don’t check out, what you could do is since you already tagged them in the system and you set that, oh they already seen the product recommendation, you can enroll them into an autoresponder sequence that follows up with them in I don’t know like a day to remind them that, hey, you were looking at these, did you want to check out? So in terms of cart abandonment, that’s one thing that you can do. Steve: Does that imply then that you need an autoresponder per product in order to do it the way you just specified? Dana: Not necessary, you can just say, like, oh, you were looking at the product before and just send them, and just point to like the gallery above. Steve: I see, as opposed to the specific product, which would be a better implementation, right? Dana: Yeah, because if it’s only a one product, then you could follow up with it. Again, if you have a lot of product, then it might be more difficult to scale if you’re just using Chatfuel or ManyChat, because you need to build all these things manually. But you can say, like, oh, check out the gallery above and just have a arrow emoji pointing to the gallery above to kind of get them to look back at what they were looking at. Steve: How does the bot know that you actually did not finish checkout? Dana: You would — when you show them the — when you make the product recommendation, and you send them the product gallery, you can automatically enroll them into a sequence. But if they made the purchase, then you could actually remove them from that sequence. Steve: Okay. And that requires — is that something that your software handles or is that something that’s built into like Shopify, for example, or BigCommerce? Dana: I don’t know about Shopify or BigCommerce. If you’re doing it natively through Chatfuel and ManyChat and you’re getting people to check out through their software, then you could do it that way. Steve: I see. Okay. But if you’re taking them to your site for checkout, then you’d probably have to code something up with the API in order to remove people from an autoresponder sequence. Is that accurate? Dana: Yeah, so with cart abandonment, I said that there’s kind of two ways. One is the built in payment processor inside of Messenger. The other way is suppose you want them to check out through your website, which has nothing to do with Messenger at this point. So they’re just browsing your website, they add something to the cart, what you can leverage is it’s called a checkbox plug-in that you can add to your website. And if they added to the cart, you can actually trigger and enroll them into a sequence if you wanted to. But the tricky thing about the checkbox is it’s no longer pre checked. The user would actually have to check that checkbox. And it’s something that Facebook removed. I think they might reinstate it. I’ve heard of them kind of talking about reinstating that pre checked status. But one thing that you could do is have that checkbox and there’s actually a software called Recart that can actually help you with that. Steve: Yes, that’s a Shopify plug-in, right? From what I remember how that works is it used to be pre checked so that when someone added something to the cart, they were automatically opted into – they got a Messenger message sometime later that said, hey, were you looking at this and you didn’t finish checkout. Now that it’s not pre checked though, I guess the chances of them checking it are pretty slim. I know, for mine, it’s like a 1% or something in the single digits for people that check. I give a free gift on add to cart. That’s how I get people to do it. And the percentage of people checking that box even though I’m giving something for free is pretty low. Steve: So that’s just my story though yeah. Dana: I would say it’s harder with if you’re doing it inside of Messenger because you can track whether they viewed a product or not. It’s probably a little easier than to get them to physically go out of the word to check that little checkbox on your website. Steve: Yeah, it’s a tiny checkbox too, yeah, exactly. Okay. So it sounds like then that the easiest way to implement this is to actually use the payment system associated with Chatfuel or ManyChat because it’s much easier to take them off of the autoresponder sequence for example, and add them on. Dana: And add them yeah. But what you could do is, if you have a product page, you could send them to a quiz or something from your website to that quiz and teach them more about whether this product is a right fit for them and then retargeting them that way. That’s another way of doing it. But you want to provide them with some reason to actually go from your website to your Messenger bot in order to retarget them, right? You either have a quiz or have some reason where they can learn more, or click on that button to subscribe and get a discount. Because what you could do, and I think you can build like almost like a wheel of fortune inside Messenger, when you provide them with a random discount or prize and send them to that wheel of fortune feature inside Messenger. And that way you can kind of retarget them at a later date since they’re – you’re kind of gamifying it then you send to them. Steve: Right. One thing that’s also not clear to me is, and I know ManyChat sent out some emails saying that their payment system has been has been updated, and it’s unclear to me. So if you take payment through ManyChat, for example, what is the notification like? Where does that order go exactly? Steve: At Stripe? So that takes the payment information. But what about the specifics for the order and all that stuff, is that just something that you have to pre bake into the tool? Dana: No, there’s a section in ManyChat where you can see all of your order history. And you can also send a notification to yourself if you wanted to. Steve: What does the notification look like? Is it an API or is it an email? What does it look like? Steve: I see. So it sounds like the flow is you set up some transactional stuff with ManyChat, and then you get the order, you get the email, and then someone has to just manually enter that into your back end system for fulfillment. Dana: Yeah, unless you want to go through Stripe API. Dana: Yeah, I think that would be the best way too. Steve: If you want to automate it, oaky. Dana: Yeah, Stripe is the main — I mean, that’s where your actual information is anyways, like the for sure because they made the purchase. So hooking through Stripe, I would say is the easier way to do it. Steve: Sorry, for the listeners out there, we’re probably getting a little too technical there. I was just thinking in my mind how I would implement this with my own store without having to do any manual entering. And just for the benefit of the listeners out there, Stripe has these — has a really nice way where when someone makes a payment, you can actually — it’ll tell you exactly what they bought and everything. And then you can kind of tie that into your back end. There must be some plug-in available for this. And maybe if I find it, I’ll link it up in the show notes. But okay. So I think we’ve beaten abandoned cart to death. What are some other great examples that you’ve seen in the ecommerce space for bots? Steve: So let me ask you this, how would you initiate that questionnaire? Dana: How would I initiate? Steve: Yeah, how do you get someone to take it? Dana: So when you want to drive traffic to your Messenger bot somehow. So you can either have them go to your bot through your Facebook page, or a Facebook post say that you promoted or your website. And you could say something like, having a hard time deciding which product is best for you, try taking this quiz, the short quiz and our bot can help you out, something like that. Dana: When the user clicks on the button, it would initiate the quiz and it would start, and it would ask them some questions. Now, when it comes to asking these questions, it’s not an interrogation. Don’t ask too many questions because if the user makes a mistake midway, or they want to start again from the beginning, it’s not easy to do that unless you build it into your quiz. So just make it really simple, use buttons to allow them to answer. I think with Lego, they only ask like three or four questions, just enough to kind of get an idea. And then after that they share the results with you. Now, it’s not just about product recommendation, but you could also ask them like what are you trying to learn about a product, right? So you had somebody selling something about I don’t know, like skincare, right? You can also ask them, are you suffering from dry skin, or oily skin, and just use it to send users the right information that would benefit them. Because with Messenger bot, the difference between Messenger bot and a website is when you’re on a website, it’s the users’ job to look and scan your website to find where to go, and what to click to find the right information, right. You can browse the top navigation bar, you can search, you can look through all the different thumbnails and colors and pictures and whatever you have on your site. Messenger bots, you don’t have that luxury. You have a very fixed small space. And I’ve seen people trying to copy and paste and cram all their information from their website into a Messenger bot, and send large amounts of text and images. And it just does not work well at all. Steve: Yeah, so it sounds like you just need to be a lot more concise. And then keep the questionnaire very simple, pick your best selling products or your winners, and then try to steer people in that way. Dana: Yeah, it’s like a toy guy, right? It’s like, okay, what do you want to look at today? Ask them a question. And you your job when building the bot is to build all these different possible scenarios that a user might go down. So they might go down one way or another way. And you build out those separate experience and you’re putting the user into the driver seat to allow them like to let them pick where they want to go. Steve: Let me ask you this, how have different companies that you’ve interacted with, how do they mix email with Messenger, because I still feel email still drives a large quantity of traffic and sales to my shop. And I’ve been at least conflicted on which I want to grab first, because not everyone is on Facebook Messenger, especially in my customer demographic. Dana: With Messenger, the type of information that you can share is very different. So, I like to use Messenger where it’s very short bursts of information or reminders is a really good one. Say you’re hosting a webinar or a live event or anything where you want to send a reminder, that’s a really great way to follow up with users and remind them. If it’s something that’s more lengthy, like say, 300, 400 words, it’s going to be tough to try to break that down into a Messenger. I don’t know that you can easily do that. I’ve used both. It just depends on what type of content you want to send out. And at times, I’ve actually sent out a Messenger notification or a Messenger note or a broadcast, I’d say, and redirect people to video or PDF where there’s more information because I don’t try to put everything into Messenger. Steve: What about in terms of getting an email address? Like, would you go for a Messenger subscriber first over getting an email subscriber? Dana: With Messenger, it’s easier to opt in, it’s just one click. Users don’t need to fill out a form. So with if you’re on a website and you have you ask people, oh, do you want to get a free PDF or a free coupon or something. All they need to do is click on the sent Messenger and they would automatically get it. They don’t need to type in their first name. They don’t need to type in their last name. And then you also have the issue of the open rate, because open rates on Messenger is still I believe, about a 70 to 90% as opposed to email address where it’s 20 to 30%. It’s just so much lower. So, right off the bat, you already — a lot of people that you’re sending the email to are not going to open and read it in the first place. So that’s one thing to think about. Steve: I guess, for your — let’s take you, for example, do you always go for the Messenger bot first and then an email or do you get an email first? Dana: For me, because I’m teaching about Messenger, I’m actually only collecting Messenger right now, I don’t even bother with email. Dana: But that’s only for me. Steve: Right, yeah I know. Dana: It’s very different because I’m trying to teach people on Messenger. And chances are if you want to build a Messenger bot, then you’re going to have a Facebook account and Messenger. Dana: So, it’s a little different for my case. I wouldn’t say that that applies to your audience. But with yours, if you have a Facebook account, it’s so much easier to get people to opt in with Messenger. And afterwards, what you could do is ask them and follow up in that message. After they click to subscribe to your Messenger bot is ask them, hey, do you want for me to reach out by email, and ask them to type in their email address. Or there’s actually a feature available both in ManyChat and Chatfuel now where a little bubble pops up. And in that bubble, it’s kind of like an auto fill in chrome and it includes the user’s email address. And when the user taps on that email address, then you can get that email address and send it using Zapier, for example, to your email marketing software so that you’re linking the data from your Messenger bot to an email marketing platform. Steve: Okay, is there a way to do it outside Zapier at this point because my personal thought on Zapier is this like this kind of glue so to speak. That’s like an extra cost where if you just stitch them together natively, do you know have a way to just stitch them without using Zapier at this point? Dana: I always have to say that in my head, but they’re very expensive. So one of the things I’m actually working on separate on top of ThinkTuitive is a SaaS product called Codeless Bot, and its web hooks that allow you to send data collected from your Messenger bot to a third party tool like your email marketing. That will eventually — it’s in progress right now, but will probably introduce several email marketing platforms. We also integrate with Airtable. So that way if somebody makes a purchase let’s say, and you want to send that into a spreadsheet in Airtable, you can list out who bought it, what they bought, so that you have a place where you can analyze your data. I’m very analytical, so I just love doing that. Dana: I see. So you’re developing something that kind of would replace Zapier. Dana: So kind of, we’re not exactly a Zapier alternative. It’s kind of a hybrid between Zapier and hiring developer because we don’t have a user interface where you can drag and drop, and create your own triggers and actions to build everything. It’s more of a done for you plug and play, solution. Steve: That does a specific thing, right. Dana: Yeah. So Zapier, you have to build and put stuff together. It’s kind of like if you go to Home Depot, and you buy your lumbar and you’re trying to build a [inaudible 00:42:45]. We’re more of an IKEA where it’s like, that’s what you’re going to build. So just follow the simple instructions and you’ll have a piece of furniture at the end of it. Steve: I’m just curious. I mean, you’ve studied a lot of chatbots, what have been some ecommerce store strategies when sending broadcasts and promotions that you’ve seen? Dana: So with broadcast and promotion, you got to be very, very careful. I went to F8 this year. That’s Facebook’s annual conference. And it was just in May of 2018. And one of my biggest takeaways from that conference, I would say is that the Wild Wild West of Messenger bots and promotional messages are coming to an end. Dana: Yeah, so like before, I mean, they have policies and rules in place, but it wasn’t a really big priority to monitor. I don’t know if that’s the right thing to say. Like, they didn’t have the manpower to monitor all the promotional messages. But right now, as bots are getting more and more popular, they want to keep the system free of spam. They’re trying to avoid it turning into email, because with email, if you look at like a inbox that you have, there’s probably just tons of email saying, you know, promotion ending today sale on, they don’t want that to be the case. So you have to be very careful when you’re sending promotional messages. And if you’re sending promotional messages to those who are not even ready to make a purchase yet, then they’ll probably report your bot as spam. And then your bot will get banned from Facebook, which is nobody wants that. Steve: Oh, I didn’t know that. Okay, so then, now they’re actually — have you ever heard of any crackdowns up to this point? Steve: Oh really? Okay, what happened? Dana: They’re sending out promotional messages, which is not allowed. Messenger bot — I mean, when you’re using Messenger bot, you’re trying to engage and educate users about your product. You’re trying to provide value; you’re not trying to just push everybody to make a sale. And what they’re doing is just sending out a broadcast announcing a sales, and the worst one is actually around Black Friday, because I subscribed to quite a few around Black Friday. And I just got messages after messages saying sale ending or sale starting, and all of that was actually not allowed. And I got some promotional messages from really big — I won’t name names, but really big, well known national store, like clothing companies that are doing this. And I asked Facebook, I have a guy that I — a really nice guy that works at Facebook. And I actually asked him and I said, is this allowed or, you know, big brands doing this because people are going to follow big brands and copy their strategy. Dana: And I said this company that’s really well known company is doing it, is that allowed? And he said, actually no, that’s not allowed. They’re breaking the rule. Okay, that’s good to know. So don’t use it to push for promotional. And I know, let’s continue with the clothing example. You’re saying, okay, so if I don’t have promotional messages, what am I supposed to send? Everything is essentially encouraging people to make a purchase, right? Dana: So there is one bot, I don’t remember the name right now. But what they do is they sell women’s fashion, so women’s clothing and every — I think every week they send out a message about style inspiration. So here’s what you can wear for the week. So design trends, just to give people ideas about what to wear to work for that week. And of course, the message itself is actually providing value because it’s providing people with ideas on what to wear. And of course, if people are interested in those specific outfits, they’re going to ask where can I buy it? But the initial, the original intent of that newsletter that they’re sending out is to provide people with ideas and inspiration. So they’re educating, they’re engaging, their sole purpose yes it is to encourage people to make a purchase but it’s not, please buy this outfit right now. Steve: You know what’s funny is I think I was talking with McHale of ManyChat, and I sent out a broadcast once where I was like, hey, here are some of the new arrivals for our store, but he said, that was a gray area. Dana: Yes, that is true. Steve: Okay. But in terms of inspirational clothing ideas, that to me almost sounds like a gray area too. But I guess it’s a little bit different. I guess we need to phrase it a little differently. Dana: Yeah, you need to phrase it differently. I mean, when they don’t — when you look at there’s, it doesn’t seem like — it’s almost like an Instagram gallery, which you’re just seeing pictures of people or like, take a look at Sephora. What they do is they actually show you how to apply different makeups to leave a specific look, right? At the end of the day, they’re trying to get you to buy their makeup, but they don’t say there’s a sale on with this brand or lipsticks on sale. They don’t say that. They say hey, it’s Friday. Are you looking to go out tonight? Here’s a great look for the weekend or for the night. And they teach you how to apply those things. So with that, it’s education. Steve: And then once you interact, you can give them a coupon, right? Dana: Yes, that is true. So within a 24 — if the user interacted with your bot during the past 24 hours, then you can send them promotional messages. That’s allowed. But if they have not interacted with you during the past 24 hours, then you should not be sending them any promotional messages. Steve: Okay. Hey Dana, I want to give you an opportunity to talk about your company, and what you’re working on as well. So what is ThinkTuitive all about, what is your course all about and your software? Dana: Thank you so much. My site is ThinkTuitive.com, so it’s resources, articles, and there’s also a free mini course on how to get started with building a Messenger bot. And if you’re looking for something more in-depth, I do have a premium course called Bot Essentials. If you’re looking to build some more slightly advanced feature for your Messenger bot, but you don’t have a developer and you don’t want to pay crazy Zapier fees, then you could also check out codelessbot.com. Steve: Can you spell that for the audience? Steve: Codelessbot.com okay. Actually one of the reasons why I like you Dana is because you are catering to the non technical people which is a lot of the listeners for this podcast. Dana: Yeah that’s one of my goals. And if those are all still so hard to spell, you could also visit DanaTran.me, that’s DanaT-R-A-N.M-E and it’s just a quick link to kind of my site Codeless Bot and as well as my contact detail if you want to reach out for some reason. Then there’s DanaTran.me. Steve: That sounds great. And Dana, I will link all those up in the show notes. And you should check out Dana’s bot because — I forget — see I get you on Facebook Messenger. But I remember I tried to go through, I went through your site once and you have a really good bot. I actually thought I was talking to you for a split second until … so. Steve: I mean, it’s called Dana bot, but you know. Steve: I still wasn’t clear. Well hey Dana, thanks a lot for coming on the show. I really appreciate your time. And I’m glad we actually finally got around to scheduling this interview. Dana: All right. Well, it was really a great pleasure to be on the show. So thank you so much. Hope you enjoyed that episode. Dana lives and breathes this stuff every day. And she’s been a great help in getting my Messenger bots in order. And in the grand scheme of things, we’ve actually only scratched the surface when it comes to Messenger marketing, and I’m excited for what’s to come. For more information about this episode, go to mywifequitherjob.com/episode232. I also want to thank Klaviyo which is my email marketing platform of choice for e-commerce merchants where you can easily put together automated flows like an abandoned cart sequence, a post-purchase flow, a win-back campaign, basically all these sequences that will make you money on autopilot. So, head on over to mywifequitherjob.com/K-L-A-V-I-Y-O, once again, that’s mywifequitherjob.com/K-L-A-V-I-Y-O. Now I talk about how I use all these tools on my blog, and if you’re interested in starting your own e-commerce store, head on over to mywifequitherjob.com and sign up for my free six-day mini course. Just type in your email and I’ll send you the course right away. Thanks for listening.